A 'creative revolution' that enables you to create and edit your own music videos has just launched in the UK. 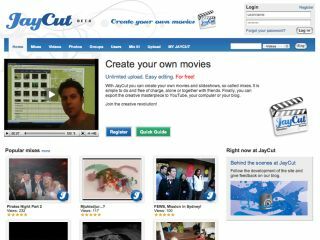 JayCut is a collaborative online video editing website where you can upload your photos, videos and music in some 100 formats to put on your personal media archive on the website. Then you can mix a video by adding clips together, trimming bits out, adding effects, transitions, captions and audio - all free of charge. Unlike desktop editing applications there is a social aspect on JayCut, which means that you can create closed groups (with people you have travelled with, supporters of a sports team, or with fellow fans of a band), or join a group, and make video masterpieces together. The results can be embedded on your blog and social networking websites, or exported in high resolution back to your computer. Your videos can be a maximum of 150MB in size, but if you want to create longer clips, multiple 150MB clips can be edited together to create a larger clip. JayCut uses a proprietary server which creates low resolution versions of the clips you upload to make the online editing process quicker. When you're done you can export a high resolution clip to your blog, video sharing websites such as YouTube and Google Video , and social networking websites such as Facebook or MySpace . JayCut is just launching in the UK after a trial run in Sweden for the past seven months. The website has just received its 1,000th registered user, according to Fredrik Samanta, managing director of JayCut. JayCut works on both PC and Mac and is a completely web-based service. It supports Internet Explorer, Safari, Firefox and Opera, and there is no need for downloads or configurations to get it working. "What sets JayCut apart from other online video editing applications is the collaboration in closed groups and the possibility to export mixes back to your computer," Samanta said. "This results in a simpler, more seamless experience."